Environmentalists join with political consultants to try to find a way to woo fickle Western voters. Democrat Ted Strickland and Republican Wayne Allard trade environmental jabs and punches in a tight Senate race in Colorado. Liberal Democrat Ross Anderson may prevail against millionaire Republican and frequent political candidate Merrill Cook in Utah. In Montana's race for the House, mud-slinging Republican Rick Hill tackles a charismatic, Democratic Crow Indian, Bill Yellowtail, whose checkered past includes wife-battering. In California, Michela Alioto, granddaughter of former San Francisco mayor Joseph Alioto, offers a green-sounding alternative to Republican incumbent Frank Riggs. In Montana, Democratic incumbent Max Baucus forges ahead of Republican challenger Dennis Rehberg in the race for the Senate. 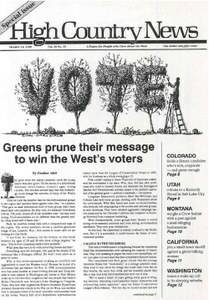 In Washington, environmentalists defeated in the 1992 election scramble to mobilize the suburbs and win back the state's voters. In Arizona, a state with a history of eccentric and sometimes impeached politicians, Democrat Steve Owens challenges colorful Republican congressman J.D. Hayworth. Nevada: Who hates nuclear waste most? In Nevada, a tight race for Congress has Republican John Ensign and Democrat Bob Coffin arguing over which of them hates the Yucca Mountain Nuclear Repository the most. Indian activist Russell LaFountaine drives across the West in a motorhome called "Vote-Catcher "96," trying to encourage Native Americans to vote. Colorado's other congressional races are almost over, most analysts say. Not many surprises in store for Utah in upcoming elections, analysts say. In Montana, Republican Marc Racicot will probably stay governor, although other races could tilt the state back to the middle. In Washington, Democrats hope to win back the state Legislature that went to Republicans two years ago. Republicans seem to be solidly entrenched in Arizona, but some environmentalists see a possible shift in the direction of moderation. Environmental concerns may help moderates regain ground in Idaho. Democrats hope to make progress in Oregon at both state and national levels. In New Mexico, Native American gambling interests fight a battle against environmentalist candidates. The fate of school-trust lands and other public-land issues divide Democrat Kathy Karpan and Republican Mike Enzi in the race for retiring Sen. Alan Simpson's seat. Economist Thomas Michael Power says wise-use supporters are worshiping at the rear-view mirror and need to accept the fact that the West is changing. The National Fish and Wildlife Foundation announces winners at its "Bring Back the Natives" campaign to restore riparian areas and native fish. The Older American Program encourages retirees to help out at national forests and parks. The Mineral Policy Center publishes "The Green Mining Guide: Mining Experts You Can Call." The Western Colorado Congress gives out "Not-So-Smart Growth" awards. The 18th annual public lands law conference in Missoula, Mont., Oct. 24-25, is called "Managing America's Public Lands: Proposals For the Future." Rachael Paschal of the Center for Environmental Law and Policy tries to convince Washington state that there is not enough water for everyone who wants it. The four wolves shot for killing livestock in Montana had badly maimed paws - and 14 puppies to feed. Rutting elk go after human women in Yellowstone National Park. Boise residents acquire sandbags in expectation of a bad flood season. The Nature Conservancy purchases the Dugout Ranch near Canyonlands National Park in Utah, to prevent the land from being subdivided and developed. Through lawsuits and activism, the Navajos in Utah's San Juan County win rights taken for granted by Anglos. The under-rated issue of voter turnout may be the key to a shift in Washington politics. At a wise-use conference in Casper, Wyo., participants express a variety of concerns and possible solutions to what they see as the West's problems.